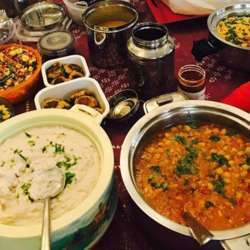 We would love to have you participate in a light vegan potluck dinner we are arranging. If you're not familiar with the concept, then a potluck dinner is a dinner party where everyone brings a dish to share. Please just keep it Vegan, light, and so no cooking needs to take place (warming up the dish is possible though, but pls bring the pot with you) and so you can take leftovers back with you. Bring along whatever you like to drink, we will worry for the rest. Please let me or Astrid know what dish, appetizer, desert or snack you like to bring so we can coordinate, and PLS CONFIRM YOUR ATTENDANCE UP UNTIL 2 DAYS BEFORE THE EVENT. The exact address will be sent after registration and confirmation.